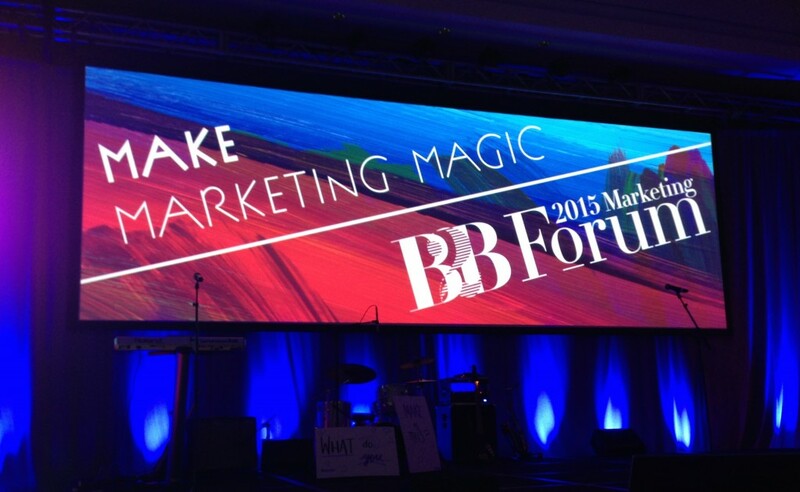 I have just returned from MarketingProfs’ B2B Marketing Forum 2015 in Boston. The last time I attended was in 2007, back when B2B marketers were still puzzled by social media. I can’t help reflecting on how much has changed. Here are my personal, top take-aways on the state of B2B marketing, as represented by this gathering. The conference was filled with examples of entertaining, educational, and engaging marketing from B2B companies. In everything from clever copy to creative videos (such as Adobe Marketing Cloud and The Launch), B2B marketers are raising the bar with engaging content. The conference itself was a meta example of creative B2B marketing. From the opening keynote, with anything-but-boring Avinash Kaushik to the closing keynote by Peter Sagal from NPR’s Wait Wait, Don’t Tell Me, and all the events and speakers in between, the conference delivered fresh and entertaining content. To paraphrase Nick Westergaard in his session on branding, “You cannot play the B2B card” as an excuse to keep doing the same, predictable things. The rules are changing. My subscription marketer’s heart grew a few sizes bigger listening to Avinash Kaushik’s opening keynote. He suggests that marketers define audiences according to their intents rather than psychographics or segments. Marketers need content and programs that map to four key intents, which he calls see, think, do, and care. You don’t serve up a free trial offering to someone who has no intention yet to take action (someone in the ‘see’ or ‘think’ stage.) And you match intent to social media channels, which align with different intentions. What Avinash Kaushik calls marketing for the care intent, I call value nurturing. Call it whatever you want – just remember that marketing has a role to play after the initial sale. If there was one consistent theme across the sessions I attended, it was this: successful B2B marketers are able to see the world from their customers’ eyes. When you incorporate the customer’s perspective in marketing, you know how to earn and keep attention. You understand the problems you are solving, and avoid “firehosing” people with the wrong information at the wrong time. You stay on top of changing perceptions, and adjust with the market needs. How will we sell this back home? Entrenched marketing practices and beliefs are difficult to displace. Doing what you have always done seems safe. But as more businesses adopt customer-centric, empathetic marketing approaches, staying stuck in the past is risky. From Nick Westergaard’s session on branding: “Transparent, simple brands move faster and gain trust.” And trust may be the most important asset in today’s economy. Technology plays a pivotal role in today’s marketing world, with videos, social media, inbound media, metrics and tracking… the list goes on and on. Conferences like the B2B Marketing Forum offer marketers a chance to keep up with those changing technologies. And what we know is that personal connections matter. In our attempt to craft the perfect message, or create the ideal digital brand, we cannot afford to lose sight of the human connections. Conferences are a chance to convert online acquaintances into in-person friends. The B2B Marketing Forum delivered on that premise in spades. It’s a brave new world of B2B marketing. No. 3 stood out as the key point for me. In fact, I shared it at our Monday morning staff meeting. “We need to stop talking about how great we are – blah, blah, blah — and empathize with what our client needs. That’s the shift we need to make.” Nice work here, Anne. Thanks, Pete. It turns out to be challenging to implement, though! Good luck. Anne it was great to see you at this year’s forum. I agree with Pete — #3 on your post is the big takeaway for me. Empathy allows us to see the world through the eyes of our buyers. We’re all hard-wired for empathy as human beings, it’s time to use our natural skills and put it to good use. Thanks, Katie — great recap, with the marching band! I’m a sucker for a marching band. Thanks, Rob. Next time I’ll have to meet up with you in person. Your two-dimensional, flat-Rob self was a valued dinner companion, though, courtesy of the unstoppable Sheryl Brown. I quite like the idea of empathetic marketing. I have been in b2b email lists selling for long and I think the process of become unnecessary serious. If we can implement empathetic marketing, then that can lead to better customer engagement. I quite agree, Rosie. Thanks!